This first layout might just be my favorite of the bunch. 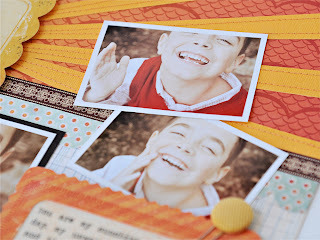 Not only do I adore that Cosmo Cricket paper that reminds me of a sunset, but these are some of my favorite pictures of Darian that really show his infectious smile and sweet personality. I used my Silhouette (a new toy) to create the "sunbeams" and added lots of stitching for even more texture and detail. The orange frame by Glitz (from the Mossy Knoll add on) was the perfect place to house my journaling that I printed on vellum and then laid over a piece of cardstock I had spritzed with Mister Huey's in Sunshine. I can't wait to get this kit! I love your layout. :) Pinning it on my Pinterest! I adored your gallery, Lynn! LOVE the LO! The sunburst is perfect! Can't wait to see more!